To understand the behaviour of cracks and its effect on the failure capacity, deformation tests are carried out on concrete structures. Using photogrammetry as measurement method and the evaluation software PHIDIAS[PHIDIAS was developed by the Geodetic Institute at the RWTH Aachen] is able to determine the deformations in a two dimensional way. 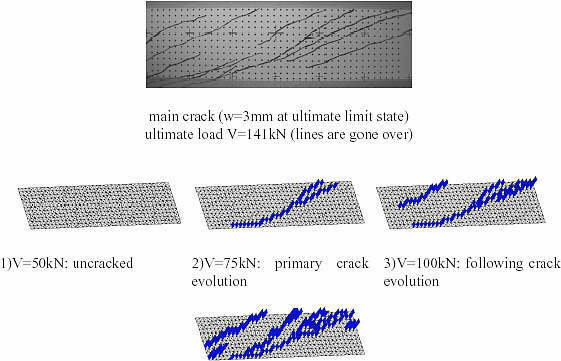 Hence, the crack pattern will be extracted by the program RIZ[RIZ is used as a prototype for evaluation of cracks] using methods of intensification and tracing. The graphic representation and a finite element method, which is in development to improve the crack pattern in a recursive way, is realized by the program ORFEUS[ORFEUS is used by the Chairs of Statics and Concrete Structures] . Alternatively to the control of the program RIZ an expert system is scheduled. To activate the full bearing capacity, a formation of cracks is inevitable at reinforced concrete structures. In view of the appearance, damages as a result of corrosion and also for the realisation of transmission of forces over already existing crack edges the crack width must be limited.Intensive research tries to generate suitable design and construction rules for development and progressive evolution of cracks. The research is part of a "Sonderforschungsbereich" - SFB 532- defined and encouraged by the DFG (German research association), for textile concrete at the RWTH Aachen. As a member the Geodetic Institute Aachen is developing methods by usingphotogrammetry. This is an easy manageable measurement method, to detect two-dimensional information about the crack pattern and about a single crack. In addition, the method allows statements of crack evolution and history. Photogrammetry is a contactless measurement method. The main measurement instrument is a digital camera, to get the surveyed object with several measurement images from different directions (figure 1). The object is prepared on the surface with a grid of targets. In addition there exists calibration bars, which define the scale (figure 2). Fig 1: Position of camera for measurement of a loading step. 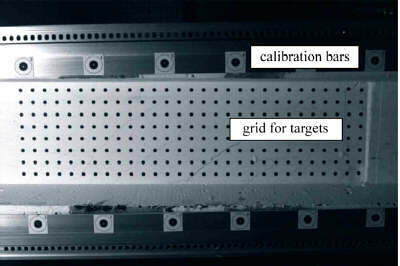 Fig 2: Shear beam with grid of targets and calibration bars. The images are imported and analysed with the digital evaluation software PHIDIAS . By using redundant image information from several photo directions it is possible to calculate both the target coordinates with their standard deviation and the positions of the camera. As method of calculation the photogrammetric bundle adjustment with self calibration of the camera is used, whereby the optical path between object and photo cell is reconstructed mathematically. This method enables an accuracy of coordinates up to 3mm for a target point. That is important for the following calculation to detect very fine cracks, as they occur e.g. at the deformation of textile- reinforced concrete structures. Preparing the target points happens by a backing film. Its minimum distance amounts due to the fabrication 5m. Fig 3: Deformation tests using photogrammetry (Institute for concrete structures RWTH Aachen (IMB) (1,2,3,5) and Institute for concrete structures TU Darmstadt (4)). Tensile tests (1) are used on the one hand for basic tests of reinforcement and concrete. On the other hand they are well suitable for researching the photogrammetry and the automatic crack detection. The width of separation cracks can be easily estimated, because the test is only loaded by normal force. 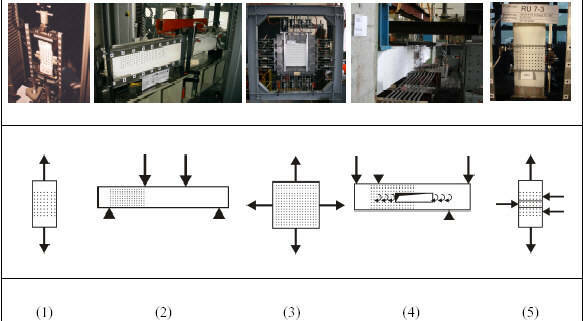 Shear tests (2) are more complex. They are used by the institute for concrete structures Aachen(IMB) to research shear cracks. Reinforced and prestressed concrete beams as rectangle and I-beam section and smaller thin-walled textile-reinforced concrete I-beams are analysed by a photogrammetric measurement field at the area of shear cracks. The following special tests can also be worked with the method: Plate tests (3), beams with openings (4), or tests with special moved areas to research the behaviour of the crack edges (5), show some more application of photogrammetry. The program RIZ accesses the coordinates and calculates the difference of two loading steps to get the motion of every measuring point. The extension between neighbouring points is searched. Fig 4: Motion of measuring points in a shear area of a shear test (Output of vectors with GNUPLOT) and original image (cracks are drawn). In figure 5 the structures of cracks may be recognised. An automatic, software-based analysis of cracks has to collect the structures to coherent cracks. In addition, it must regard that crack widths are very small, especially as they occur at textile-reinforced concrete structures. Or a big crack edge shift at shear cracks or crossing cracks at plate tests effects the detection. Fig 5: Difference of neighbouring vertical vectors. Figure 6 shows the overview about the automatic crack extraction. It will be described in detail in the following. 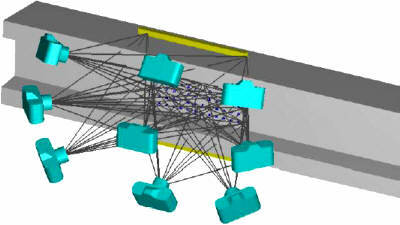 Fig 6: Operating sequence of the crack analysis. The measured values are delivered as three-dimensional coordinate triples on the surface of a structure. The output of PHIDIAS yields measured values m and standard deviations s for RIZ. By comparing the coordinates of a measured point in two different loading steps the displace ment is calculated. The difference of displacement of two points denotes the "credit" length- variation fw of a distance (e.g. of an edge from an element composed of four neighbouring points). The material gives the "debit" length-variation fm, where the crack theoretically occurs. Both parameters are statistically distributed. By the difference of the distributions the crack probability pcrack is calculated as shown in figure 7 and it is used for the following evaluation. Fig 7: Calculating the probability of cracks. The control module accesses the calculated crack probabilities and effects the process of crack extraction. The module decides about the order and use of methods to analyse and defines defaults. It can be influenced manually. As an alternative there will be developed an automation using an expert system in the future. This positions the knowledge about optimisation by choosing the analyse methods in the program. Fig 8: Displacement pattern and extracted crack pattern. After the crack probability is locally determined, coherent cracks must be detected. The algorithm for tracing crack structures works similarly to the contour-tracing method of Wahl . It starts at an initialisation edge and searches the way with the highest probability. Meanwhile it marks located edges and a surrounding area of dispersion length. If the crack probability is undergoing a limit, the tracing is suspended and it is looking for a new initialisation edge of an further crack. The run of a crack will be detected on the basis of weighted crack probabilities of edges in the direct and indirect neighbourhood. In some test types like tensile and shear tests, a crack doesn't change abruptly its direction. This can be noticed in the following calculation. The graphic output is done by the finite element program ORFEUS . The display of the crack patterns is possible on the basis of cracked edges on an grid. Also, the difference displacements are shown, and as a result the efficiency of crack extraction is controlled (figure 8). Fig 9: Calculation of crack opening displacement vector, crack width w and parallel crack shift v.
A cracked element, composed by four neighbouring measured points, is separated in two parts. The displacements of the measured points in both parts are summarized to a mean value The difference vector provides information about the relative displacement in the crack. The crack doesn't open orthogonal to the crack. For this reason the angle q differs to the real crack angle b, it is possible to convert the relative displacement by trigonometric functions into crack width and parallel crack shift. At present the crack detection is expanded using a following finite element simulation by the program ORFEUS for the calculation of stresses in the cracked structure. Therefore a plate is generated sized as the measured field and the measured displacements are raised as external displacements. For this the areas, which are identified as crack locations, are approximated by crack elements, which can represent discontinuity in the displacement field. The crack pattern analysis can be started recursively using the calculated tensions of the finite element simulation based on the predefinition of crack probabilities. Fig 10: Crack pattern after exceed the ultimate limit state and crack extraction in load steps. As a prototype for automatic crack detection the program RIZ was developed. It realizes the implementation of the presented methods. As an example a test of an pretensioned beam is shown, which is analysed in the web region for shear cracks by photogrammetry. In figure 10 the crack pattern is shown at the ultimate limit state and the crack evolution of progressive load steps. The analysis automatically takes place. The formation of the crack pattern is clearly recognisable. W. Benning and R. Schwermann. Phidias-MS - Eine digitale Photogrammetrieapplikation unter Micro Station für Nahbereichsanwendungen. Allgemeine Vermessungsnachrichten AVN, Heft 1, 1997. R. Chudoba and M Konrad. Contributions to computational and experimental investigation of engineering materials and structures. Dynamic Algorithmic Components for the Development of the Finite Element Software, CTU Reports, special edition, edited by Zdenek Bittnar, Prague 2003. S. Görtz. Zum Schubrissverhalten von profilierten Stahlbeton- und Spannbetonbauteilen aus Normal- und aus Hochleistungsbeton. Entwurf Dissertation, Institut für Massivbau RWTH Aachen, 2002. F. M. Wahl. Digital Image Signal Processing. Artech Publishing, 1987. statements of crack evolution and history.